And, even as they all chip in their own contribution to the song, not a soul will give a thought to who wrote the rest of it. But it was, in fact, written. It didn't simply emerge fully formed from the primeval swamp. If you'd gone to a birthday party a century and a quarter ago, nobody would have sung "Happy Birthday". It's certainly written with the same economy of vocabulary as Patty Hill's original - six words, no rhymes. (The only rhymes in "Happy Birthday To You" are in children's parodies: "you look like a monkey who belongs in the zoo", etc.) But there's no evidence Patty Hill had anything to do with this new lyric, and certainly her sister didn't: Mildred had died in 1916. Yet the second verse had a far wider appeal than the first: when Western Union introduced the singing telegram in 1933, this was, inevitably, the first number to be so wired. By then, it had appeared in two Broadway musicals, The Band Wagon and As Thousands Cheer, whose scores included respectively "Dancing In The Dark" and "Easter Parade". 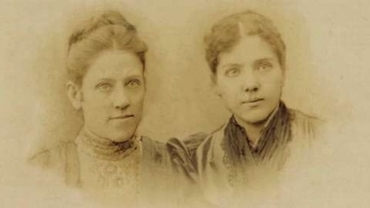 But, unlike Schwartz & Dietz and Irving Berlin, the Hill sisters weren't making any dough off their musical efforts. So a third Hill sibling, Jessica, took legal action on their behalf. Meanwhile, in 1935 the Clayton F Summy Company of Chicago published "Happy Birthday" in an arrangement by Preston Ware Orem and managed to copyright it as an entirely new musical work. That's right: "Happy Birthday To You" was a legally enforceable intellectual property. It's not true, as was widely rumored for many years, that Paul McCartney owns the copyright: his publishing rights with respect to children's songs begin and end with the stage musical Annie. But "Happy Birthday" was nevertheless a copyrighted work until the second decade of the twenty-first century. The Clayton F Summy Company became Birch Tree Music, and Birch Tree Music was bought by Warner Chappell, the world's biggest music publisher and thus in a position to take their copyrights very seriously. If you wanted to use "Happy Birthday" in a movie or TV show, they'd charge you many thousands of dollars for the privilege, which is why it hardly ever happened: the world's most performed song is a routine feature of the cultural landscape yet all but entirely absent from our film and television catalogues. See for yourself - the next time there's a birthday scene in the movie, watch for the cake, the candles, the wishes, but wait in vain for the "Happy Birthday" singalong. And, if they do sing it, it'll be just an excerpt. There's a party scene in The Rocky Horror Show in which someone calls out "Start to sing 'Happy Birthday' but don't finish it", and (doubtless on legal advice) Dr Frank N Furter cuts off the caterwauling after one line. That's also why the more nervous restaurateurs insist the wait staff serenade their customers with limp pseudo-funky birthday greetings, just in case the Ascap enforcement squad is on the prowl. Under Warner Chappell, "Happy Birthday to You" became the most lucrative song in the world, earning the company two million a year, decade in, decade. And, obviously, they had no desire to see that wither away: When it comes to happy birthdays, it's better to receive than to give. Warner Chappell's grip on "Happy Birthday To You" had never been tested in court, in part because they've got the deepest pockets in the world and you haven't. But it rested on the curious proposition that there are two entirely different songs: "Good Morning To All", a copyrighted song whose copyright had expired and was in the public domain, and "Happy Birthday To You", a copyrighted song with an identical melody to the out-of-copyright one that nevertheless remained in copyright and was eminently enforceable. And they were both written by the same people: Mildred and Patty Hill. This is a very bizarre interpretation of law. For a start, the only musical difference between the two songs is one note: The "good" of "Good morning to you" is one syllable whereas the "happy" of "Happy birthday to you" is two syllables, so an extra note was found to accommodate it. In no other circumstances has that ever been regarded as sufficient to make something an entirely separate composition: lyricists often ask a composer if they'll mind splitting a crotchet into quavers so they can shoehorn in their preferred adjective; many otherwise identical eight-bar phrases will have such barely detectable variations from one section to the next. And, if that one note is sufficient to make "Happy Birthday" legally an entirely different song from "Good Morning", then so is every variation sung at every birthday party in the world: after all, every time you sing "Happy birthday, dear Billy-Bob" or "Happy birthday, dear Victoria", you're adding at least as much new lyrical content and (in the case of polysyllabic names) musical content as the "composer" of "Happy Birthday To You" added to "Good Morning To All". As for the lyric, the first recorded publication of "Happy Birthday To You" was as the second verse of "Good Morning To All". In other words, the entirely separate in-copyright song was first published as part of the out-of-copyright song. And that's before you go back to the 19th century and address the similarities between "Good Morning To All" and "Happy Greetings To All" and "Good Night To You All", both of the last published in 1858 and almost certainly known to a musicologist such as Mildred Hill. A hundred and twenty-three years? But wait a minute: 1893 plus 123 equals 2016. What happened? What happened was a lady called Jennifer Nelson. Ms Nelson is a documentary maker who had gotten interested in contemporary birthday rituals and had decided to make a film called Good Morning to All, which, as its title suggests, was about the history of "Happy Birthday". She paid $1,500 to Warner Chappell for a license to use it in her documentary (part of the average five grand per day Warner's were raking in from the number) and then promptly sued the company for falsely claiming ownership of the song. On September 22nd 2015 Judge George H King granted summary judgment to the plaintiffs on the grounds that Warner Chappell had failed to prove they had ever held copyright to the song. Nine months later - June 28th 2016 - the publishing behemoth finally abandoned their claims to "Happy Birthday", agreed to repay $14 million to the various licensees they'd improperly charged, and stipulated to an official declaration that the song was now in the public domain. It would be insensitive to send a birthday card to Warner Chappell, but I believe Hallmark do do cards for Deepest Sympathy on Loss of Enforceable Copyright. PS As I said, the old music biz saw is that where there's a hit there's a writ. So this was the perfect song to celebrate both the first birthday of The Mark Steyn Club, and our spectacular victory in the CRTV vs Steyn case. But, if you like musically minded litigation, you may be interested to know that last week CRTV filed a brand new suit against me, this time for a mere $5 million. The complaint is 200 pages long and includes as exhibits two of my recent Song of the Week selections, "We Are the Champions" and "Oh, Happy Day". Apparently, Cary Katz, the weirdly insecure and paranoid owner of CRTV, believes those two essays are disparaging and defamatory of him, even though neither mentions him or his company. So we're running a special birthday competition for readers to identify anything actionable in that "Happy Day" column. Email your entry here. We've had a lot of jolly entries, and I'll select the best at the end of this coming week. The winner will receive a year's subscription to CRTV. The second-placed entry will win (all together now) two subscriptions to CRTV. 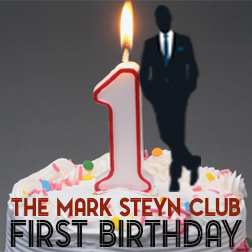 Happy birthday to The Mark Steyn Club, which, as Mark mentioned, is one year old this very day - and happy birthday also to our first-day Founding Members, starting with a gentleman from small-town Idaho who was the very first to sign up just after noon on May 6th 2017. We hope that fans of our musical endeavors at SteynOnline will want to sign up for a second year. As we always say, club membership isn't for everybody, but it helps keep all our content out there for everybody, in print, audio, video, on everything from civilizational collapse to our Sunday song selections. And we're proud to say that thanks to the Steyn Club this site now offers more free content than ever before in our fifteen-year history. What is The Mark Steyn Club? Well, it's an audio Book of the Month Club, and a video poetry circle, and a live music club. We don't (yet) have a clubhouse, but we do have other benefits including an upcoming cruise. And, if you've got some kith or kin who might like the sound of all that and more, we also have a special Gift Membership. More details here. Mark: may we pick out our in gift to you to celebrate the Club's First Anniversary? Because, erstwhile perveyor of all things Steyn, it seems to me that, rather than entertain the possibility of becoming a member of CRTV, perhaps we should set up and contribute that money to the Mark Steyn CRTV Defense Fund, because the obvious objective if Mr. Katz is to bankrupt you by forcing you to spend additional attorney and Court fees defending yourself. How very left-wing and despicable of of him! You have been a freedom fighter from the get-go, and we cannot allow this sleazebucket to endure. You must prevail, and I know I would be willing to make such a worthwhile and important contribution. I am putting my money on you. We have your back! How can Mark Levin even look himself in the mirror each morning? If one sleeps with swine, one is going to get filthy, and maybe contract a fatal case of swine flu. Happy Birthday to the Mark Steyn Club. My husband and I have signed up for the cruise!! It will be the highlight of 2018 for us!! Thanks, Cynthia. See you in September! Woo hoo! The Mark Steyn Club and I share the same birthday - May 6th! Since I joined in 2018, I did not realize this. Now that I know I shall cherish my membership even more! Happy birthday, Deborah! Next year let's plan a double party. This reminds me of the old Cheech and Chong joke of the 1970s: "The three most performed songs of all time, according to ASCAP, are 1) Happy Birthday to You, 2) Auld Lang Syne, and 3) In a Gadda da Vida! Well, thank you. May 6 is my birthday also! Proud to be a founding member of this wonderful Club! It was my pleasure to renew my membership a few days ago, ahead of the renewal date. Boy oh boy, would I love to go on the Steyn at Sea cruise. Unfortunately it doesn't look like the timing will work and I'm sure it will sell out quickly so I won't be able to squeak in at the last minute if the dates do become available on my calendar. I hope there will be a recap of sorts, so the unlucky landlubbers can read all about it. Good story behind the birthday song, Mark! The birthday song amounted to a big "hill of beans" for someone other than the Hill sisters. Now we know the whole story when we next belt it out. Personally, it's the readings of the "Tales for Our Times" and the backstories to all these great songs that have hooked me for keeps. So, Happy Birthday to all who show up here at the MSC and best wishes for you, Mark Steyn, and your continued successes since you make it all so enjoyable for the rest of us. My wife bought me this Mark Steyn Club Founding Membership for my birthday (May 17). We both find it odd, however, that the membership is in her name. To add insult to injury, so to speak, the autographed book that came with the membership was autographed to her, not me. LOL! Oh well. Happy birthday, Club, and many happy returns. Happy Birthday to all Mark Steyn Club members! Aye, James. And God bless us, every one! Happy Birthday to the one and only 'The Mark Steyn Club'- the only club who would have me as a member that I would be a member of! Wishing you continued success!